There were a number of sessions which highlighted big data and cloud computing’s implementation in the healthcare industry. It seems that service providers already started developing platforms and frameworks using latest technologies to collect data from all available sources and visualize its analysis. There is a clear benefit to connecting different databases and maintaining historical data as this will help to accurately predict the output. Priyadarshan Shinde, Software Specialist from the Pune office, enjoyed this workshop which was designed to demonstrate Google’s approach to identifying problems/solutions, and managing an innovative, agile culture. There were hands-on-activities; these included designing a working prototype for a public garden in a city, in a limited amount of time. The workshop covered: how to take user interviews, note taking, generating ideas, prioritizing the ideas and finally with help of readily available material, create a visual prototype. Priyadarshan felt this was fantastic opportunity to try out innovative and different thought processes with a visual representation to provide domain knowledge to an entire team. Communication is key for all projects and Priyadarshan will apply these techniques to development, testing, QA, and general management practices going forward. Rohan Sathe, Software Enthusiast at Cytel was keen to learn more on this topic particularly as R Shiny is gaining such importance in the industry. The Cytel team also delivered a hands-on workshop at PhUSE called Interactive Graphics with R and Shiny. The R Shiny application was implemented with two main objectives. Firstly, a graphical interface was designed to create graphics and explore data interactively (without any programming skills) to carry out analysis of data. Secondly, the R code of those graphics can be exported and used to easily reproduce the plots of interest. The R shiny application was implemented to create graphs which can be further used to carry out analysis of data. A provision was there to save the R code along with the input values for future use and reproducibility of results. R shiny apps can be created for custom software requirement. No programming skills were required to use the app. Apps can be useful for statisticians to analyze data. Working in this way allows programmers and statisticians to come together to perform complex data analysis. The session showcased advanced capabilities of Shiny and reinforced that Shiny is being used more widely in the industry. As this area continues to grow it will be beneficial to have more people trained in R and R Shiny. Tejasweeni Rajput, Senior Team Lead of Biostatistics and Janhavi Kale, Software Enthusiast were both interested in the paper presented in this session. Forest plots (FPs) are graphical displays originally developed for meta-analyses to present results obtained from multiple clinical trials addressing the same question or endpoint. Often, the measurement of effect presented in the FP is an Odds Ratio, or mean difference, comparing treatment to control. It should be considered an important and useful analysis results visualization tool that programmers and statisticians use in daily practice. The paper presented the use of FPs as an ideal tool to summarize key messages and endpoints from multiple tabular summaries into a single graph, which would offer a broad heuristic view of trial results, with an enhanced understanding of overall treatment effects. Tejasweeni Rajput said “After the session, I went away with a different perspective on viewing the forest plots beyond meta-analysis and felt that using forest plots to visualize multiple endpoints could be suggested in some of the exploratory analyses." Janhavi Kale commented “I have learned how to represent multiple endpoint data in one forest plot. The advantage here is that it saves a lot of time and the effort of creating multiple tables and gives the clear picture of data on one plot." Tejasweeni Rajput, Senior Technical Lead-Biostatistics attended this session to learn more about the new methodology that could be applied when looking at survival analysis for our clients. In clinical trials, Adverse Events (AEs) are captured over time and the incidence and time of the first occurrence of an event are presented descriptively. However, better methods are needed to combine and present AE incidence and duration information over time. The paper presented investigated “Probability of Being in Response” method to display and meaningful interpretation of AE data over time in clinical trials. Tejasweeni Rajput commented “Traditionally the Kaplan Meier method is used to visualize AE data overtime, in this session an alternative methodology was presented “Probability of Being in Response Function (PBRF)”. I would be keen to try this new methodology in some of the studies Cytel is currently working on, particularly when working extensively on survival analysis for clients”. Attracting and Selecting, Growing and Retaining Top Talent in your Organisation: the Evolution of the Job description, presented by Garry Latham from D-Wise. 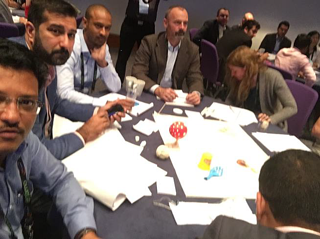 Caroline Terrill, Associate Director, Local Head of Statistical Programming UK attended the two-hour interactive session, not only to support Cytel's Sebastien Gerin, Senior Vice President, BDM but to gain a wider perspective on attracting talent in a competitive market. The session focused on the job description and why it might not be the best way to attract people out of the industry. 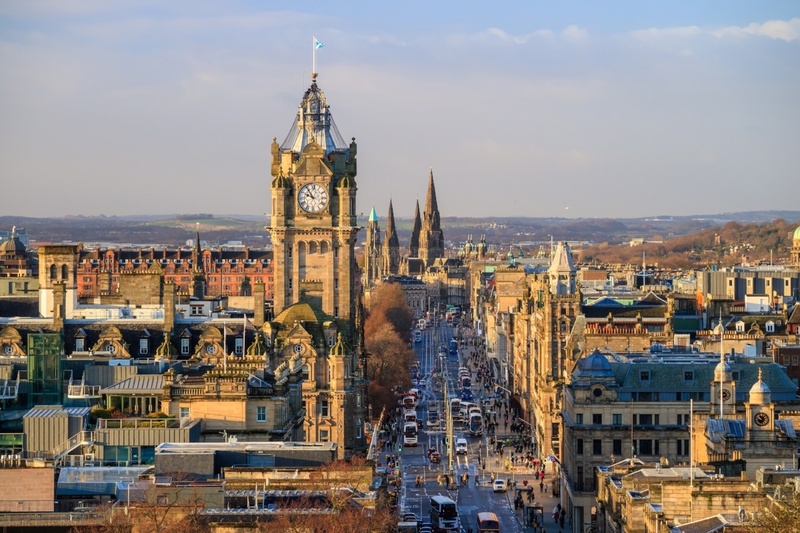 There was also a lengthy discussion about it being more important to find people who fit with the culture and ethos of the company, rather than the number of years of experience they have. Experience can be gained, but if the fit isn’t right, it is unlikely to be successful. Part of Caroline’s role is to grow the UK based team of programmers and from her previous experience she knows this can be a difficult and time-consuming process. The competition for talent within the industry is very high and it’s important to find the right cultural fit when selecting the right people, growing them in the right way to ensure companies retain the people they want. Caroline commented “It is essential to ensure the candidate fits in well with the team and processes at the company during selection time. Growing and retaining talented individuals is likely to be dependent on the relationship with their manager, so the manager needs to work hard to ensure this is a productive relationship." The posters covered a wide variety of topics and presented some thought-provoking concepts, the Cytel team reviewed several of these posters and here share their thoughts. This is an open working group formed for research on health devices and technologies. They are trying to build a platform for the use of future technologies in clinical trials. This is a very interesting area and one to watch as different technology and domain experts across the industry came together to create a platform, all looking for a unified solution. Priyadarshan Shinde, Software Specialist from Pune, had a personal interest in this group and would like to become actively involved in supporting its work. Last year, at Roche China several job rotation opportunities were created for the staff to help them explore their career interests, based on the business needs and their competencies. The poster introduced these cases, included their backgrounds, purposes, competency requirements, and outcomes. The poster described a new lattice model which provides employees more variety and extensive opportunities along the career path, instead of the traditional ladder model. Rohan Sathe is a Software Enthusiast at Cytel and the content of this poster really resonated with him. For him the key take away was that this proposed career model will help employees to broaden their skills, find challenging and rewarding work, and contribute to the company in new areas. This poster was a highlight for Tejasweeni Rajput, Senior Technical Lead-Biostatistics from our Mumbai office. With the increasing adoption of SAS Grid environments, the old-school programming environment (SAS Display Manager System – DMS) is unable to operate in a Grid environment due to the way that SAS Grid is deployed. As we move away from directly interacting with SAS we are being forced into using environments like Enterprise Guide (EG) and SAS Studio. Lawrence Heaton-Wright in his company uses SAS Studio as front end for access to SAS. He mentioned several reasons for choosing SAS studio as there are many similarities between DMS and Studio, the centralised distribution of the web-based Studio and the ability to customise and develop tasks and utilities alongside the centralised deployment of them. Tejasweeni was familiar with the SAS enterprise guide but not with SAS studio; this poster outlined another SAS grid environment and its capabilities which will be beneficial knowledge in the future. 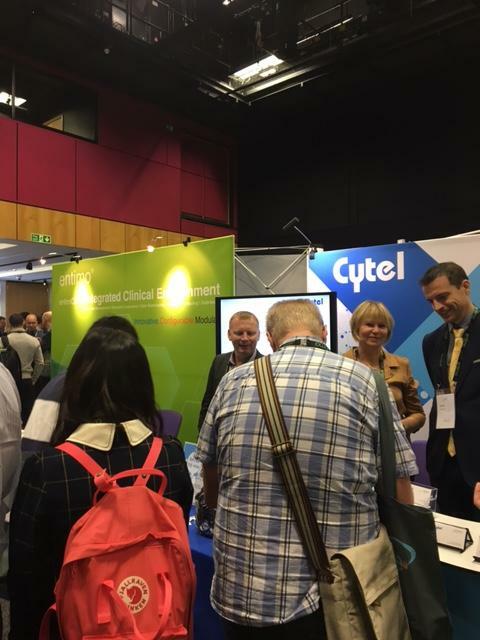 Cytel led a number of well received sessions at PhUSE and we are delighted to share the full slide sets from Cytel contributions. Click the button below to access the slides. Whitepaper: FlexRandomizer®: Easy Randomization in Real Time.